Though the Sky Blues are still a step from liquidation, the club persistently continue their policy of moving to Northampton. Fans decided to boycott the move and will go to a different stadium on league opening day. Tomorrow Coventry City play their first home game of the season. Except it won't be played at home, but in Northampton, roughly 35 miles (56km) away from Coventry. It's hard to imagine worse atmosphere surrounding a season opener: the club has no money and may go into liquidation soon. They were already deducted 10 points and have antagonised their own supporters with the relocation. As a result only 1,000 tickets have been sold until yesterday and up to ten times as many fans are expected to show up at Ricoh Arena, the recent home of Sky Blues, where an opposition 'legends game' is to be held, showing the displeasure with club owners' actions. 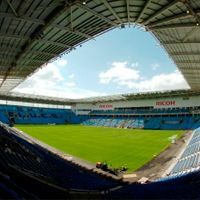 “Most people will be making their protest by going to the charity game at Ricoh rather than going to Northampton,” said Jan Mokrzycki, spokesman for the Sky Blue Trust, a fans’ group campaigning for the club to stay in Coventry. “We want to send a powerful message in a legal and lawful way.